OF ALL the excuses served up by the United States in the aftermath of the outsourced lynching of Saddam Hussein on December 30, none is more dishonest than the claim that the trial, conviction, sentencing, and execution of the deposed Iraqi President was solely the handiwork of the "sovereign" government of Iraq. Apart from micromanaging the trial court's statute, the U.S. actively assisted the Iraqi Higher Criminal Court through the Regime Crimes Liaison Office (RCLO) housed in the American Embassy in Baghdad. U.S. minders from the RCLO oversaw the tenuous evidence produced in the Dujail case against Saddam, the serious deficiencies in trial procedure which have been amply documented by United Nations working groups and others, the blatant politicisation of the trial by the occupation-installed government of Prime Minister Nouri al-Maliki, as well as the deliberate scuttling of Saddam's right to a proper defence. The irony is that there would have been no reason for any American or British leader to disown responsibility for the lynching — or plant stories about "differences" with the Iraqi government about the timing and mode of execution — had the sinister hooded men who finally dispatched Saddam stuck to a sanitised script. 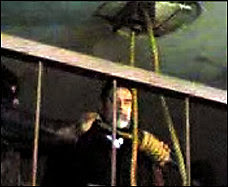 Like the widely circulated picture postcards of lynchings across the American south in the early 20th century, the grainy cell-phone video of Saddam's last moments conveyed to the whole world the tastelessness of raw power unrestricted by either law or morality. But unlike those good ol' American lynchings — in which the mob leaders posed proudly by their hanging Black trophies — the ringleaders of the Baghdad hanging party absented themselves from the embarrassing frame, preferring the "plausible deniability" of being sound asleep in Texas and Washington. When L. Paul Bremer and the Coalition Provisional Authority drafted the original statute of the Iraqi Higher Criminal Court in 2003, they were careful to limit its mandate in two crucial ways. First, the court was given jurisdiction only for war crimes and crimes against humanity committed between July 17, 1968, and May 1, 2003. And secondly, it was stipulated that the court could try any natural person "whether Iraqi or non-Iraqi" suspected of committing these grave offences provided he or she was a "resident of Iraq." The first limitation ensured that the court would not have any jurisdiction over U.S. occupation troops and commanders stationed in Iraq after President George W. Bush declared the end of "major combat operations" on May 1, 2003. This is regardless of overwhelming evidence that these troops have engaged in the killing and torture of non-combatants in Hadithiya, Fallujah, Abu Ghraib, and other places in Iraq over the past three-and-a-half years. The second limitation — of residency — ensured that the court would not be free to probe charges that U.S. persons had committed war crimes and crimes against humanity against the civilian population of Iraq prior to May 1, 2003. This means that the charge of U.S. collusion with the dictatorship of Saddam Hussein in the commission of atrocities against the Iraqi Kurds and against Iran, not to speak of the genocide of Iraqi children caused by the 12-year-long economic embargo of the country, nor indeed the killing of civilians through the disproportionate, unnecessary, and wholly illegal use of air power and military force from 1991 up to May 1, 2003, would be completely outside the purview of scrutiny by the special "higher" Iraqi tribunal. The court's statute stresses that an individual can be charged with war crimes or crimes against humanity if the impugned violence he orders or takes part in is "part of an extensive and systematic action launched against the civilian population" and is known by him to be so. Both the Saddam regime and the U.S. invasion and occupation took the lives of thousands of civilians. Though the U.S. acknowledges countless civilians have been killed in its military actions in Iraq, it denies any criminal liability on the grounds that it does not "intentionally target civilians." Broadly speaking, whatever defence Saddam was allowed to mount essentially revolved around the same claim. In its 298-page written opinion, the Iraqi court rejected this claim. But in finding Saddam guilty, it has, paradoxically, opened the way for criminal liability to be assigned to U.S. leaders and commanders, as and when a future sovereign Iraqi government has the courage to remove the unnatural restrictions placed on the higher court's mandate. The court listed several pieces of evidence that, it claimed, established Saddam's guilt but not beyond reasonable doubt. To make the final leap, therefore, the court was forced to construe the disproportionate, excessive, and unnecessary use of force as tantamount to extensive and systematic action against civilians. Since there was no direct evidence linking Saddam to the death of civilians, the tribunal argued that the disproportionate use of force against Dujail town by the Iraqi government and armed forces in the aftermath of the failed assassination attempt on Saddam in 1982 was in and of itself a crime against humanity for which he bore "collaborative" criminal liability. That attack led to the death of eight civilians as well as the subsequent arrest, trial and execution of around 100 others, besides the death in custody due to torture or neglect of another 40. "Saddam Hussein," it ruled, "issued his orders, directly or indirectly... to attack the town of Dujail after the unsuccessful attempt on his life by a few individuals and that large-scale attack was not necessary nor appropriate for that very limited attempt ... perpetrating those acts which were a violation of the law, and shelling of fields while their owners were in them with helicopters was not necessary and was not an `appropriate' answer at all from the points of quantity and quality ... That large-scale and organized attack and its effects constitute crimes against humanity, including deliberate killing as a crime against humanity." If the attack on a town, which claimed the life of eight civilians and then another 140 more over two years, constitutes a crime against humanity, what about the "large-scale and organised" U.S. attack on the whole of Iraq, which initially claimed the lives of up to 10,000 civilians and has since led to the death of 650,000 more innocent Iraqis? Saddam Hussein could at least claim there was an attempt on his life; but what about the weapons of mass destruction Mr. Bush said the invasion of Iraq was all about? The legal precedent of establishing criminal liability extends also to torture. The court ruled that though "none of the plaintiffs has stated that Saddam has personally tortured them ... [or] that Saddam has ordered that," the deposed President was nevertheless guilty as charged. Saddam, it said, had "implicitly acknowledged his awareness of those practices that took place at the intelligence and Abu Ghraib prisons" when he said in court, `Such acts and harms that occurred against [the plaintiffs] were a mistake and violate the law.' Based on that, this court sees that the accused Saddam Hussein had issued an order ... which is an order, even if it is not explicit, to torture the victims from the Dujail residents ... Therefore, the accused is criminally accountable for torturing the Dujail residents." In the case of the torture of Iraqi civilians by U.S. soldiers in Abu Ghraib, there is documentary evidence of the fact that the Bush administration — at the highest levels — had sanctioned illegal interrogation methods. Senior U.S. officials, including President Bush, have acknowledged the reality of what happened and described them as "mistakes," much as Saddam did in court. If Saddam could be held criminally accountable for torture despite the absence of any written order, any honest court would not think twice before convicting Mr. Bush and Donald Rumsfeld for what went on in Abu Ghraib. The Iraqi court and those who control it are, of course, not honest. But a crucial test of sovereignty and democracy for any future Iraqi government will surely be its willingness to hold to account the criminals who have scripted the terrible tragedy that has been enacted in Iraq since the 2003 invasion. Could the author please clarify under what specific international treaty/convention has the disproportionate use of force between two warring parties been out-lawed. I am sure the author will know much better than me but if I am not mistaken all uses of force in international legal terms (of geneva convention and so on) must conform to requirement of proportionality and necessity in order to be legal. The last time I checked, neither of the Geneva Conventions nor the U.N. Charter contained any mention about the "proportionality" and/or "necessity". To the best of my knowledge the both the Geneva Conventions deal with the conduct of war and NOT with declaration and/or legality. We all know that right or wrong, no one in this country will ever face legal charges of any kind for any war whatever laws there are anywhere. We can express our opinions, but that is all they ever will be. Breakdown's statement is not something I, for one, "know", although despairingly, it looks true. Remember the Nazis were put on trial at Nuremberg for war crimes. No power, no matter how super, can last as Supreme forever. Don't give in to the despairing view, because the appearance of power is, in reality, a temporal thing, and in bigger, say, geological terms, an illusion. OK, in smaller-than-geological terms, maybe just a few years, the "trial" by public opinion will go down. Admittedly, many big-name criminals are never punished for their crimes. But with great grassroots journalism like that of the author, bringing in public opinion can be far more powerful than you may think or realize. The balance of power is always delicate, even with brute force. One well-placed falling asteroid, for example, could change it all forever. In 200 years, descendents of slaves now run for president. That doesn't mean we have Equality. But it means "there's a chance." As to the point of this article, it expresses exactly what I always felt intuitively was wrong with this whole picture. There is something VERY WRONG with one country invading another and orchestrating its leader's assassination WITHOUT being first asked to by some kind of expression of the citizens of that country. What happened to the idea of national sovereignty? Could it be this "borderless" message of US actions that is met by an "equal and opposite reaction" of Islamic internationalists' vision of a united Islamic Nation under one leader? It's just another superpower. Point/Counterpoint.